Making An $84,000 Cure For Hepatitis C Affordable For All : Shots - Health News The U.S. recently approved a drug that can quickly cure hepatitis C in many patients. But its high price means the treatment is out of reach for millions of people in the developing world. Now the pill's manufacturer is talking with Indian producers to reduce the treatment cost to $2,000. But critics say the price drop won't be enough. A girl with hepatitis C holds a medical report while being treated at a hospital in Hefei, China, in 2011. China has one of the greatest burdens of hepatitis C, but it's still not clear whether a deal for lower prices for a new drug from Gilead Sciences will apply there. It's well worth watching as drugmaker Gilead Sciences tries to solve this riddle for Solvadi, a newly approved drug for the deadly liver infection hepatitis C that afflicts more than 150 million people around the world. 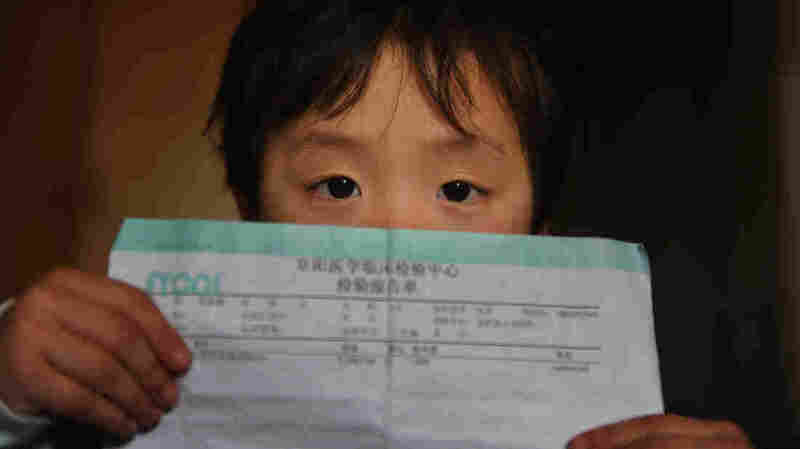 Solvadi sells for $1,000 a pill in the U.S. That price means a three-month regimen for hepatitis C costs $84,000. We think a $2,000 price tag, although a discount from U.S. prices, is not going to get the job done. It's a discount from a price we think is absolutely outrageous. More than 3 million Americans are infected with hepatitis C. Many of them are poor or incarcerated. In the U.S., Gilead says it will rely on insurance coverage plus giveaway "patient assistance" programs for people who aren't insured. Sensitive to anger over its pricing decision in the U.S., Gilead is talking to generic drugmakers in India about a licensing deal that would set the price at $2,000 per treatment course, or 2 percent of the U.S. price, for 60 low-income countries. Even so, activists are very unhappy with Gilead. It's not yet clear whether the pricing deal would include middle-income countries, such as India, China and Egypt, which have particularly heavy burdens of hepatitis C.
And activists say that $2,000 is unaffordable to all but the wealthy in most low- and middle-income countries, where governments, insurers or global payers aren't covering hepatitis C treatment. "We think a $2,000 price tag, although a discount from U.S. prices, is not going to get the job done," says Rohit Malpani, a policy director of Doctors Without Borders. "It's a discount from a price we think is absolutely outrageous. The way we look at it is, how much does this drug cost to make and what is patients' ability to pay?" Solvadi can be made for far less, Malpani and other critics say, perhaps $68 to $136 for a 12-week treatment course. "We know from our experience treating HIV over the past decade and a half that treatment needs to be simple and affordable," Malpani says in a Doctors Without Borders statement. "Full hepatitis C treatment needs to be available for no more than $500 per person." For its part, Gilead holds out the possibility that the price of a hepatitis C cure could fall below $2,000 if Indian generic producers that license Solvadi decide to lower their price on their own because of competition. "We'll be working probably with three to five different companies," Gregg Alton of Gilead told The Hindu Business Line. "We leave it up to the Indian companies to bring the price down, should they choose to do that." 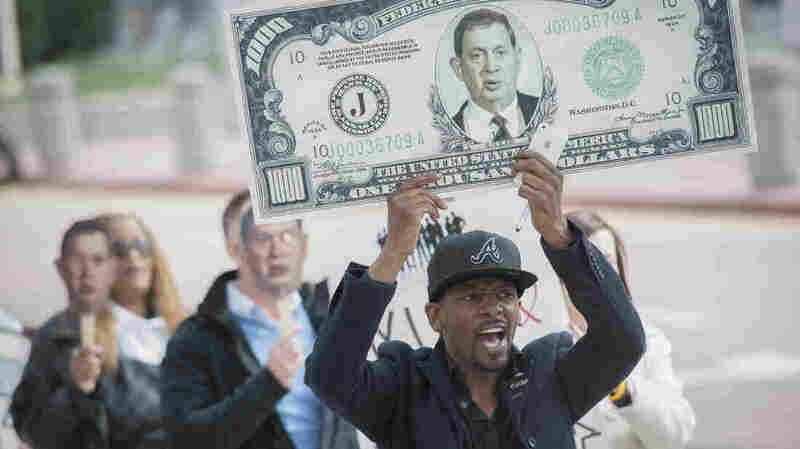 Timothy Webb and other advocates protest the cost of HIV drugs manufactured by the pharmaceutical company Gilead outside an AIDS conference in Atlanta in March. Gilead is now coming under fire for the high cost of its hepatitis C drug Sovaldi. Moreover, Alton says, the $2,000 price point is "substantially less" than what it currently costs in places such as India to treat hepatitis C with inferior drugs. And Solvadi will "be more effective, less toxic and easier to use and without side-effects," he adds. The company hopes to announce voluntary licensing deals "in the next couple of months," Alton says, with market availability in about two years. Malpani thinks the California company's hurry to sign licensing agreements with Indian generic drugmakers has a lot to do with a legal challenge filed last November against Gilead's patent application for Solvadi, known generically as sofosbuvir. The nonprofit group I-MAK, or the Initiative for Medicines, Access and Knowledge, filed the patent challenge. And it characterizes Solvadi as based on "old science" with "a known compound." Thus, I-MAK asserts, the drug does not meet India's stringent requirements for patentability. "We think there's a strong claim to invalidate any patent case," Malpani tells Shots. Meanwhile, he says, voluntary licensure is a way for Gilead to protect itself from patent problems. "It's completely an end run," he says. For one thing, voluntary licensing agreements can contain a clause barring generic companies from challenging patents. And if it turns out that Gilead's patent claim fails, those generic-makers that aren't bound by voluntary licensing agreements could offer Solvadi at whatever price they chose without paying royalties to Gilead. Critics are also upset that Gilead reportedly plans to restrict its voluntary licensing agreements to sales in 60 countries — far fewer than are covered by such agreements for HIV drugs. Law professor Brook Baker at Northeastern University in Boston, an adviser to Health Global Access Project, or Health GAP, notes that Gilead allows generic manufacturers to sell its HIV drugs in over 100 countries. "So why not a similarly large number of countries for the hepatitis C drug?" Baker tells Shots. "An important question to ask is what are their access intentions for countries that have high hepatitis C burdens?" For instance, 22 percent of people in Egypt are infected with the virus, the World Health Organization reported, while 3.2 percent of Chinese have hepatitis C.
The Solvadi pricing issue is "very important" in the struggle to ensure access to new medicines for those who need them most and can afford them least, Baker says. "The system is broken now," he says. "Why can't we have a system that ensures that research and development is paid for without needing to recoup those costs through high prices — most of which is not plowed back into R&D?" Brook favors an idea gaining currency among critics called delinkage, in which governments support pharmaceutical research and development as public good. At the same time, drugmakers largely confine themselves to manufacturing, marketing and distribution. But such a far-reaching reform is not likely to happen overnight. For the foreseeable future, pricing of new drugs such as Solvadi will be hammered out through a complex process of business decisions, activist pressures, legal claims and the politics of affected countries.